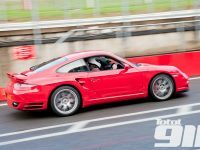 On Friday we brought you exclusive snapshots of the pitside action at Parrfest: the inaugural meet & greet trackday from independent Porsche specialists Parr Motorsport. A successful maiden event saw the pitlane at Brands Hatch filled with 911 enthusiasts keen to test their track skills on the Kent course, with extra guidance from the Parr racing team at hand to help improve technique and times throughout the day. The event also presented customers with the chance to experience the in-car thrill of a Carrera Cup 911, with Ben Barker giving hot laps in his P2 car from the 2012 GB championship. Here, in part two of our picture special instalment, we bring you more exclusive shots of trackside action from the event, also capturing the entertainment from the pitlane as the cars filed in and out throughout the day, too. Parr owner Paul Robe has promised us the bubbly, friendly atmosphere at the inaugural Parrfest will be replicated at a second event in the new year, providing another opportunity to get up close and personal with the successful Carrera Cup racing team for those who missed out this time round. And, after such a joyous occasion meeting so many 911 enthusiasts over a bed of humming flat sixes adorning the circuit in the background, the next Parrfest can’t come round soon enough. The first instalment of our pictures from Parrfest can be found on the Total 911 website here.